"He will not be mocked," the woman repeatedly said. "The greatest deception here is this is not one nation under God. It never was. The Constitution would not have been written by Freemasons. They go against God. You cannot serve two masters." Gerry Connolly, a Democratic Congressman from Virginia, was quoted by the Washington Post as saying the stenographer was a well-liked figure in the House. "I think there's a lot of sympathy, because something clearly happened there," Connolly said. Yes, something clearly happened. For a brief moment in Congress someone dared to speak the unspeakable truth about an organization that both founded and controls the government of the United States. While this story is quickly being characterized as the "ranting of a mad woman" many see it as an opening to question the history and agenda of the Freemasons. 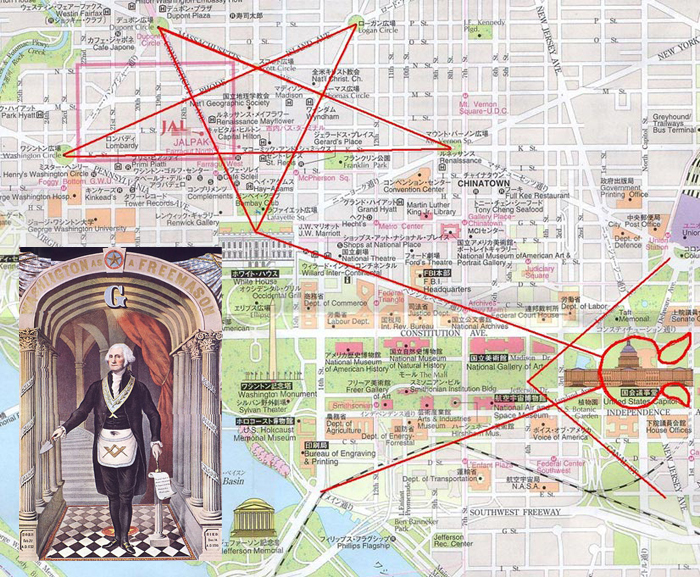 Take any good street map of downtown Washington, D.C. and find the Capitol Building. Facing the Capitol from the Mall and using the Capitol building as the head or top of the Compass, the left leg is represented by Pennsylvania Ave. and the right leg, Maryland Ave. The Square is found in the usual Masonic position with the intersection of Canal St. and Louisiana Ave. The left leg of the Compass stands on the White House and the right leg stands on the Jefferson Memorial. The circle drive and short streets behind the building form the head and ears of what Satanists call the Goat Of Mendes or Goat's head! The House stenographer was absolutely correct. America is not "one nation under God" but rather "one nation under Lucifer." If you doubt this, continue reading. 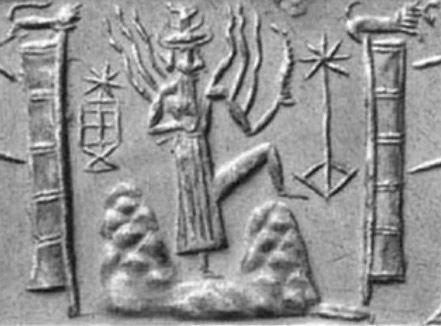 The image above is a drawing of a cylinder seal that is over 6,000 years old. 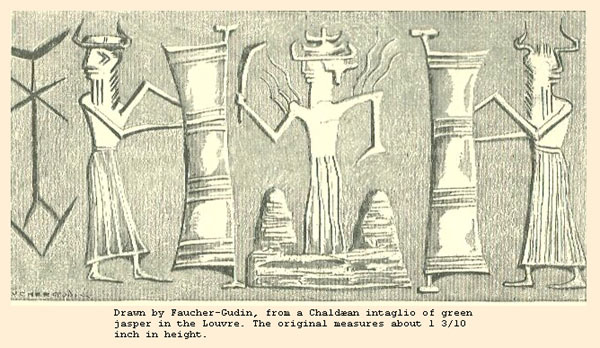 According to the late Sumerian scholar, Zecharia Sitchin, this depicts the ancient "deity" Bur.Buru, literally meaning "he who solves secrets," also known as Buzur, "God of the deep mines," and in Hebrew, Nahash, the serpent. Below is another example of the same "deity". Notice the symbol on the right. Although this appears in Sumerian culture many millennia before the creation of Freemasonry, it is the source of Masonic symbolism. "In Egypt they had a symbol of very great significance, called the Arrow of Ra, which includes both the square of the R.W.M. and his gavel of office. (Plate VIII) (page 260). In our plate the different parts are separate, but sometimes they are joined together, and then one gets the effect of an arrow, whence it is named the Arrow of Ra, the Sun-God, who was also called Horus of the Double Horizon, the Son of Osiris and Isis, and yet a reincarnation of Osiris, God in evolution. The lower portion of the drawing refers to His descent into matter, the inverted square signifying descent, and the angle beneath symbolizing the cavern of matter into which He went down. The upper square then indicates that He ascended or rose again. The symbol in the centre -- that of the double axe -- is that of the Most High God; so the complete glyph is thus a kind of symbolic creed, which for those who drew it affirmed their faith in the descent of the Deity into matter and His final triumphant ascension from it: "descended He; ascended He". If we were to interpret it along lines of Christian symbology we might call it the emblem of the crucified and triumphant Christ; but it is also a token of the whole method of evolution. This device appears in many places. It is to be seen in the museum of the Louvre in Paris, engraved upon a Chaldaean intaglio made of green jasper. It is also to be found on the walls of some very old churches in Devonshire and Cornwall in England, where it must have been engraved by the wandering Freemasons who built those churches, for the orthodox Christians could have known nothing of it." Although an initiate may advance from one level to the next, the initiation does not mean that the knowledge of that level has been understood, rather it means that the knowledge about to be learned is to be subject to certain oaths prior to its revelation. The real "Initiation" happens when the Mason actively pursues the knowledge himself.
" ... yet in the actual exercise of soul archetecture, Initiation succeeds Initiation upon increasingly higher levels of the ladder as the individual becomes correspondingly ripe for them, able to bear their strain and assimilate their revelations." The raison d'etre of Freemasonry is to change human culture and establish dissent from the Universal Truth, as described earlier. "The fraternity itself exists in order to keep fixed in a man a certain set of influence and in order to bring about certain changes in the world, etc. ; its secrecy is a means to that end and helps to make such a purpose possible." "The Masonic Lodge is not a mere social organization but is composed of all who have bonded themselves together to learn and apply the principles of mysticism and the occult. Albert Pike (December 29, 1809 - April 2, 1891) was an attorney, Confederate officer, writer, and Freemason. Pike is the only Confederate military officer or figure to be honored with an outdoor statue in Washington, D.C. He first joined the Independent Order of Odd Fellows in 1840 then had in the interim joined a Masonic Lodge and become extremely active in the affairs of the organization, being elected Sovereign Grand Commander of the Scottish Rite's Southern Jurisdiction in 1859. He remained Sovereign Grand Commander for the remainder of his life (a total of thirty-two years), devoting a large amount of his time to developing the rituals of the order. Notably, he published a book called Morals and Dogma of the Ancient and Accepted Scottish Rite of Freemasonry in 1871, of which there were several subsequent editions. Albert Pike has often been named as influential in the early Ku Klux Klan, being named in 1905 as "the chief judicial officer" of the Klan by a sympathetic historian of the early Klan, Walter Fleming. He was cited as the leader of the Arkansas Ku Klux Klan. However this has been a controversial subject with Masonic authors saying that it "is impossible to either substantiate or disprove" involvement in the Klan. "When the Mason learns that the key to the warrior on the block is the proper application of the dynamo of living power, he has learned the mystery of his Craft. The seething energies of Lucifer are in his hands, and before he may step onward and upward, he must prove his ability to properly apply energy. The Masonic "Temple" is actually a kind of religion where members unknowingly (or knowingly) pay respects to Lucifer in the form of Bafomet [above], symbolized by the pentagram. Higher levels claim that they are able to conjure demonic spirits, make pacts or "deals" with them and receive super-human abilities, all in the service to the leader. "I hereby promise the Great Spirit Lucifer, Prince of Demons, that each year I will bring unto him a human soul to do with as as it may please him, and in return Lucifer promises to bestow upon me the treasures of the earth and fulfil my every desire for the length of my natural life. If I fail to bring him each year the offering specified above, then my own soul shall be forfeit to him. Signed..... [ Invocant signs pact with his own blood ]"
"For example, Jesse Shephard, a philosophical mystic, who astounded witnesses with his musical performances, sang simultaneously bass and baritone and gave speeches in Arabic, French, Latin, Greek and Chaldean when in trance. Charles Linton, a clerk with little education whose automatic writing was spectacular and who wrote a monumental book of 100,000 words in four months in a handwriting different from his own..."
"In Freemasonry is concealed the mystery of creation, the answer to problems of existence and the path the student must tread in order to join those who are really the living powers behind the thrones of modern national and international affairs. The Master Mason, if he be truly a Master, is in communication with the unseen powers that move the destinies of life. Why should you care about Freemasonry? Freemasons control just about everything. They are your priests and bishops, judges and court executives, your presidents, prime ministers and congressmen, your local business and banking executives, teachers, publishers and leaders in the news and entertainment business. Aside from promoting the culture of dissent, they look after one another. They have special handshakes and phrases like "the widow's son" that they use to let others know of their membership. A Mason is bound by an oath to help another Mason in distress, or to decide favorably in a business deal or legal action. They effectively control much of humanity's financial, moral, legal and information system. What's left of our so-called freedoms? President John F. Kennedy made the following speech only days before his assassination on November 22, 1963. He knew what was going on. This is what I have learned. It seems real enough but, like the theories of the 911 attacks being an inside job, it is almost too painful to believe that it could be true. But look around you at the world we live in. Look at the influential people making the decisions that perpetuate the fear, wars, selfishness, God-less morality that permeates every facet of our culture. Open your eyes. What do you see? Below: A Freemason admits to worship of Lucifer. Note: I want to make it clear that I am not and never have been a Freemason and that I am presently in excellent health, not suicidal and a member of the NRA. It took some balls to write this. I hope it is appreciated. You may not agree with what I have written but please do your own research. Too much is at stake. Dan, Don't know if you know this but the Republican party recently changed their logo by rotating the stars to have two points up... the insignia of Baphomet, as you described in the Masonic article. Here is a copy. Wow. They don't even try to hide it now. Just wanted to drop you a line after reading the first few installments of 'What's REALLY Going On'. First off thanks again for the excellent information. I've come to enjoy your reporting style and choice of subjects over the years. I know I've mentioned my enjoyment of Viewzone before, and at the risk of being sycophantic let me again say that your website has been a consistent source of objective information without (from what I can detect) agenda on controversial, exciting, and IMPORTANT topics. Again, thank you for that. Unfortunately, I do not have any more information than what you provided in the article, but I'm afraid that I have to agree with your thoughts and think that you are correct. I have come to similar conclusions that most of the institutions which structure our society (particularly government, banking, entertainment, food production, and manufacturing) are influenced (if not outright controlled) by a handful of groups whose overarching aim does seem to be to perpetuate values of competition with the ultimate goal of distracting people from self-realization, personal evolution, and expressing their cooperation and support of one another. If I left my sentiments there it would be quite a depressing place to be, however I think that's only one side of the coin. I believe that the Universe ultimately operates from a principle of Love and as you noted, free will. And ironically, the same principle (of free will) that allows dissent in the first place (and the subsequent controlling powers) also blocks its ability to corrupt. I truly believe that any individual cannot be prevented from evolving. If one is sincere in their seeking then they will 'advance' (for lack of a better term). I know it seems like naive optimism what with the seemingly overwhelming levels of control in our society, but just look at how much information IS available. The fact that you're able to publish the material you do and find corresponding sources on youtube speaks volumes. Not to mention the volumes upon volumes of information available on psychic advancement and similar self-development methods. Anyhow, you had asked for feedback and thought I'd offer my 2 cents. Hope all is well with you. "We're narcissists... We care only about getting what we want no matter what the cost just like you. Global warming, perpetual war, toxic waste, child labor, torture, genocide, That's a small price to pay for your SUVs and your flat screen TVs, your blood diamonds, your designer jeans, your absurd garish McMansions! Futile symbols of pertanence to quell your quivering, spineless souls." 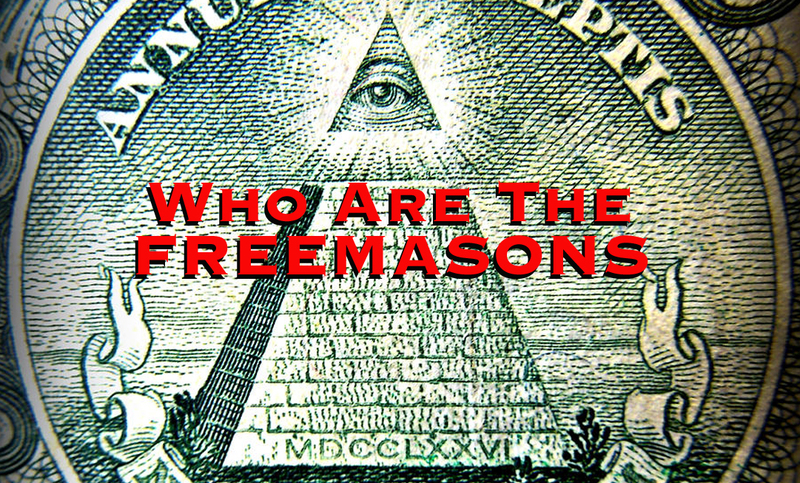 I feel that the "Freemasons" have always been backed by malevolent aliens. What are these evil secret alien agendas? I've read that these aliens need our human husks, bodies and/or DNA to be able to move around freely upon Earth without the need of spacesuits that look like the "Gray" aliens. I've also read that the "Grays" have been cloned to the point of extinction and that if they can't come up with a hybrid body... their species will die? That the aliens have been trying to create some type of human/alien hybrid species for ages now and many believe they are very close to reaching their goal? Perhaps the Draco alien species are using us as a food source as well? (shrug) Some individuals even claim that the aliens have discovered a way to remove our very souls in order for them to survive? The aliens place our bodies in a state of NDE in order to extract and capture our souls? Who knows... eh? So, while the aliens are manipulating our DNA (for their own survival) they keep mankind full of fear and hate while they direct our attention to created false flags crises etc. Encouragement of continued fighting amongst each other.... we allow aliens the needed time to complete their secret agendas. What the "Freemasons" don't realize (tragically enough) is that they too are are being manipulated! The malevolent aliens have held the carrot of total power and eternal life in front of the "Freemasons" greedy noses. When the aliens are finished with the "Freemason" suckers... too late will they have realize they too have been hosed all along. They will become the newly dead "DupedMasons!" Lastly I would like to add that perhaps good aliens are with us as well? (shrug) I think mankind must have a sort of revolution to be free of the malevolent aliens. Mankind must awaken to the fact that our species has and is being manipulated by aliens first. The benevolent aliens will not intercede unless the majority of our species understands this aspect and asks for their help? In a way... mankind has been crying out for an intervention in the not to distant past. I say this because... many people WANT planet X or a pole shift to take place... even if most of us die off as a result! Humans are desperate for this evil oppression to end anyway it can! If the Republicans do get into office (God help us all) but on the other hand... it may actually allow for the majority of Americans to finally make a stand much sooner! Surly some type of revolution/evolutional "V for Vendetta" of "We the people" will finally occur! Indeed the majority of Americans will not tolerate the Republican Draco ideals for much longer! Okay... nuff said from me... and Thank-You for letting me share my feelings with whomever is reading this. (smiles) I salute Mr. Eden along with all the other brave souls who take any risk of writing the truth for us all to read! The New World Order is NOT interested in ruling, they are interested in controlling. The strategy is though appointed stooges, surrogates and plants in high places. The bait is implied good fortune, yet few get lasting benefit. Such agents are entirely disposable. This describes Freemasonry using their own books. Click to go to YouTube and watch it in full size. This is time well invested if you want to learn the absolute truth about Freemasons. It will shock you, I am sure. You will never think the same of Freemasons again. Be advised that this video is often taken down by TPTB, supposedly for copyright violations (i.e. showing the Freemason's books which are supposed to be secret). If this happens you can usually find it posted somewhere on YouTube by entering "Secrets of Freemasonry from their own books" or similar search words. The video is 2 hours long but covers the topic thoroughly. When you view this, remember that most of your representatives in government belong to this organization, yet profess to be God-loving Christians.